This article is about the United Kingdom peerage. For its sole holder, see Edward VIII. For the rock group, see Dukes of Windsor. King Edward VIII abdicated on 11 December 1936, so that he could marry the American divorcée Wallis Simpson. At the time of the abdication, there was controversy as to how the ex-King should be titled. The new King George VI apparently brought up the idea of a title just after the abdication instrument was signed, and suggested using "the family name". Neither the Instrument of Abdication signed by Edward VIII on 10 December 1936, nor its enabling legislation, His Majesty's Declaration of Abdication Act 1936, indicated whether the king was renouncing the privileges of royal birth as well as relinquishing the throne. On 12 December 1936, at the Accession Council of the Privy Council of the United Kingdom, George VI announced he was to make his brother the "Duke of Windsor" with the style of Royal Highness. That declaration is recorded in the London Gazette. The Dukedom was formalised by Letters Patent on 8 March 1937. Edward, as a royal duke, could neither stand for election to the House of Commons nor speak on political subjects in the House of Lords. On 3 June 1937, Edward married Wallis Simpson, who upon their marriage became the Duchess of Windsor. Following his abdication, Edward and Wallis lived in exile in Paris, France. The Dukedom of Windsor became extinct on the death of its first and sole holder in 1972. The Duchess of Windsor died in 1986. The Dukedom remains vacant. 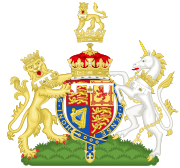 As the Royal Arms go hand-in-hand with the crown, the undifferentiated Royal Arms passed to George VI. It was and is common heraldic practice for the eldest son to differentiate his arms in his father's lifetime, but the Duke of Windsor was left in the unusual position of an eldest son needing to difference his arms after his father's death. This was done by means of a label argent of three points, bearing on the middle point an imperial crown proper. The Dukedom is currently extinct. While there was some speculation that it would be recreated for Prince Harry before his wedding to Meghan Markle, press reports also noted that its association with King Edward VIII's abdication, marriage to the twice-divorced American Wallis Simpson, and pre-War Nazi ties made it unsuitable. Harry was instead made Duke of Sussex, a title last held in 1843 by Prince Augustus Frederick. ^ "His Majesty's Declaration of Abdication Act 1936". Government of the United Kingdom. Retrieved 31 March 2015. ^ "His Majesty's Declaration Of Abdication Bill". Parliament of the United Kingdom. Retrieved 31 March 2015. ^ Prothero, David (24 September 2002). "Flags of the Royal Family, United Kingdom". Archived from the original on 31 March 2010. Retrieved 2010-04-03. ^ Scotti, Monique (19 May 2018). "A look at Harry and Meghan's new titles: Duke and Duchess of Sussex". Global News. Retrieved 19 May 2018. And then there was Windsor, which was a non-starter given that the last Duke of Windsor was the former King Edward VIII, who abdicated to marry another American divorcee, Wallis Simpson, and had some rather uncomfortable ties to the Nazis. ^ Davies, Caroline (19 May 2018). "Harry and Meghan to be Duke and Duchess of Sussex". The Guardian. Retrieved 19 May 2018. It was probably too early to bestow the title Duke of Windsor, as to do so would resurrect the memory of the Duchess of Windsor, Wallis Simpson, the last US divorcee to marry into the royal family, precipitating the abdication crisis of 1936.